Today's Throw Back Thursday (#TBT) is the penultimate part of our series featuring visitors appearing at Great Yarmouth's Beach Coach Station during August 1994. It was subsequently reported in the January 2010 issue of the PSV Circle's Overseas Journal as having been exported to Cyprus where it became TKWU129 as part of the PEAL Larnaca fleet. A small number of changes to local bus services feature in today's Notices & Proceedings Report published by the East of England Traffic Commissioner. Southwold Town Council is to amend the route, stopping places and timetable of its Southwold Shuttle service from 6th September 2017. The service, which runs from Southwold Caravan Site to the Kings Head Public House will additionally call at Oaklands and the Adnams Distribution Centre. Konectbus is to alter the route, stopping places and timetable of its 53C Old Catton to Broadland High School service from 6th September 2017. Sanders Coaches is to cease providing its 51 service between Bridge Road, Banningham and Easton College from 3rd September 2017. Not many of the residents in the Great Yarmouth and Lowestoft area would have been unaware of the East Coast Truckers convoy held every year during the Sunday prior to the August Bank Holiday. If you didn't hear the noise of the truckers horns you may have been held up in the traffic! The event is arranged by the East Coast Truckers charity raising monies for the many disadvantaged children in East Anglia. This year some 80 trucks took part in the run from Norwich's County Hall to Pleasurewood Hills at Lowestoft via Great Yarmouth. My thanks to Robert Kelly for supplying the photos. I had intended to get my own photos from the event but the camera decided it didn't want to take any (!) and unbelievably Robert was standing only a few yards from me and I didn't realise it! The first 67 plate vehicle noted for the area has been delivered to its new owners in time for the 1st of September. 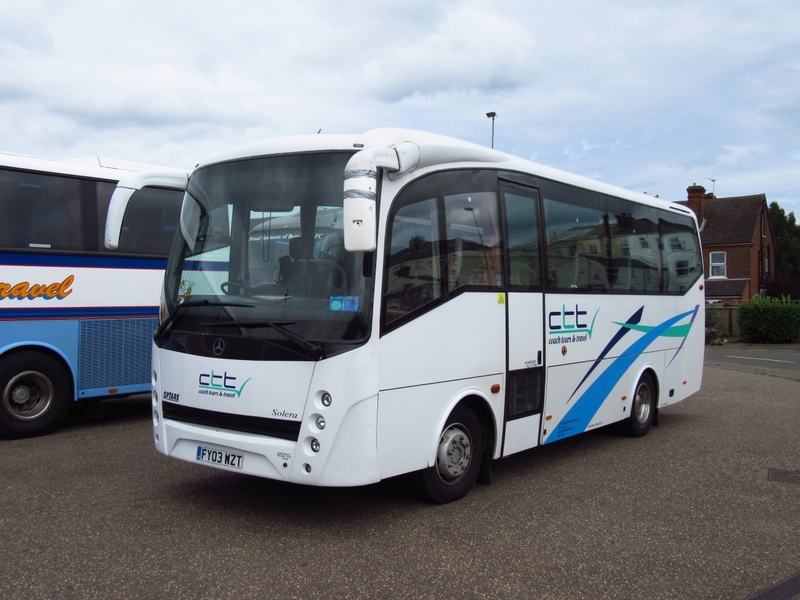 CS67BUS is a Volvo/MCV and joins the fleet of Coach Services based in Thetford. Many Thanks to Richard Mann of Volvo Bus for use of the Photograph. Further to Roy's post yesterday, i was also able to capture a few photographs whilst out and about. Firstly First Norwich Gemini 36199 (BN12WNZ) remains in use from Caister Road and i finally caught up with it working the 8's on Barnard Avenue. Secondly we reported new arrivals at Reynolds of Caister last week and i managed to come across one of them freshly outshopped in Reynolds livery with names now applied. AT07GTZ has become 'Lady Lydia' and is pictured below at their Ormesby Road Garage yesterday afternoon. Unfortunately not many reports have appeared over the last couple of weeks or so due to me having a life to lead outside the hobby (some won't believe that!) and having little spare time to seek out news, activity etc. Today I managed to get out and and about and I am able to provide some photo reports and some news. Firstly, I had made a mental note earlier in the summer to capture some Our Bus activity in the town although I have now left it a little late in the season! Early this afternoon the operator was (as usual) employing an Optare Solo on its 200 circular route from Vauxhall Holiday Park via the seafront. However, the 29 seater being used was YJ59NNL which was news to me! It must have recently been acquired from Heyfordian of Bicester who purchased it new in December 2009. I next looked in at Beach Coach Station where I was attracted to Plaxton Panther bodied Volvo B12B SF07ANV as it was displaying 'Seaside Excursion' on its destination screen. What was more unusual was fleet number 54032 appearing above the entrance. The legals showed that it was owned Long Mile Limited of Milton Keynes which provided a case for further investigation. An internet search revealed that it was delivered to Stagecoach Scotland as their 54032 in April 2007 and had been used on some Scottish Citylink services. 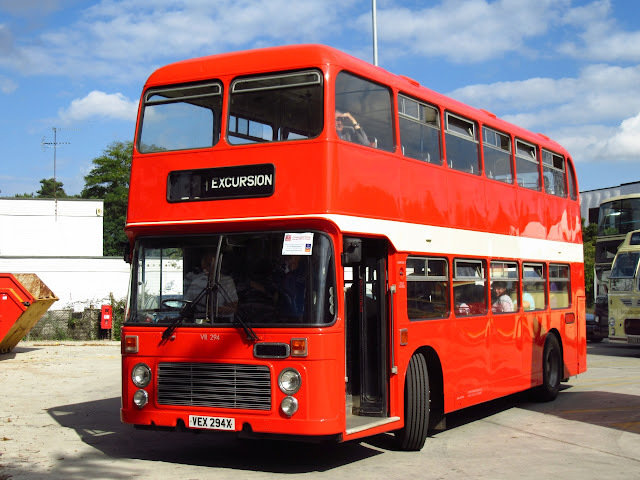 Meanwhile, news from First Eastern Counties is that former First Northampton's Wright Eclipse 66344 (MV02VCX) is to receive a new engine. Today's Throw Back Thursday (#TBT) features the fourth part of our series of visitors appearing at Great Yarmouth's Beach Coach Station during August 1994. 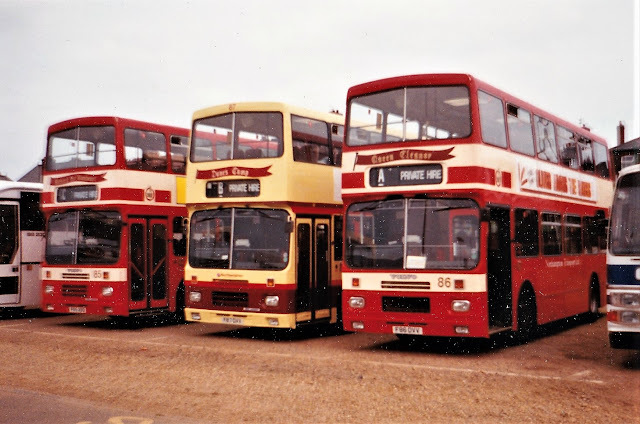 Until now we have concentrated primarily on double deckers appearing but today we start our look at the single deck variety. Our subject is a Duple 340 bodied Dennis Javelin from the East Yorkshire fleet. 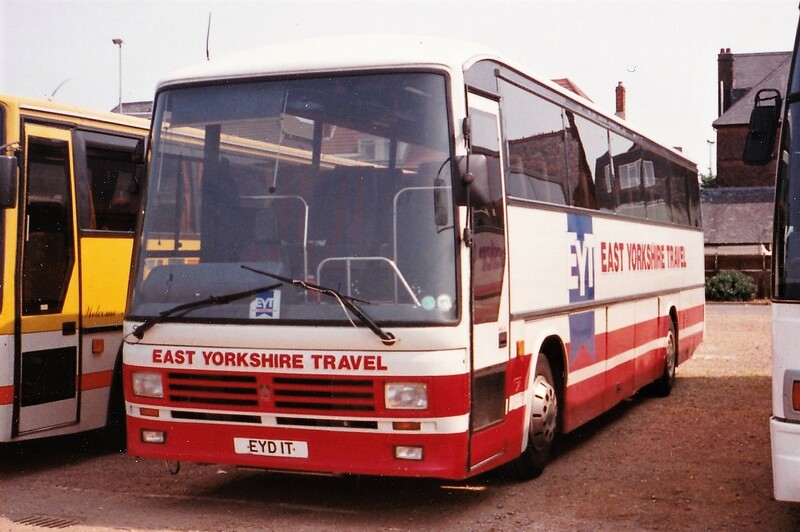 The coach was one of a number carrying the cherished EYD1T registration. The operator's origins can be traced back to the late 1920s and more recently was the subject of an eight part documentary series 'On the Yorkshire Buses' shown on Channel 5 from July 2014. Quite a few proposed changes to local bus services in today's Notices & Proceedings Report published by the East of England Traffic Commissioner. Following Ambassador Travel's loss of three school contracts serving the Cliff Park Ormiston Academy in Gorleston, First Eastern Counties has registered three new services commencing on 3rd September 2017. They are the 921 from Cobholm Tesco Store; the 922 from Great Yarmouth's Market Gates (via Hopton) and the 931 from High Road, Burgh Castle (via Belton). Anglianbus is to amend the routes, stopping places and timetables of their 87/88/X88 and BH272 services from 17th September 2017. First Eastern Counties is to amend the 1/1A service timetable between Lowestoft and Martham (via Great Yarmouth) from 24th September 2017. So far unreported here is that Reynolds Coaches has disposed of its Plaxton Cheetah bodied Mercedes Benz O814D E52HBB. Named Lady Violeta, the 29 seat minicoach was sold last year to Wiseman of Sabden in Lancashire after Reynolds acquired it two years previously from the Ministry of Defence. My thanks to the PSV Circle for the information. There were some unusual visitors to Great Yarmouth's Beach Coach Station yesterday as I witnessed when I visited around lunchtime. North Norfolk based Sanders Coaches recent new arrival was in Great Yarmouth today. NS17GAS is a Yutong TC9 and it was sitting in the car park at the town's ASDA store this afternoon. This week's #TBT (Throw Back Thursday) features part three of our look at visitors appearing at Great Yarmouth's Beach Coach Station during August 1994. Today's subject continues with the double deck theme and shows East London Coaches 486CLT which was one of five former West Midlands PTE Leyland Titan/Park Royals passing to London Transport. It was new in January 1979 as WDA3T and carried fleet number 7003 when with the PTE. 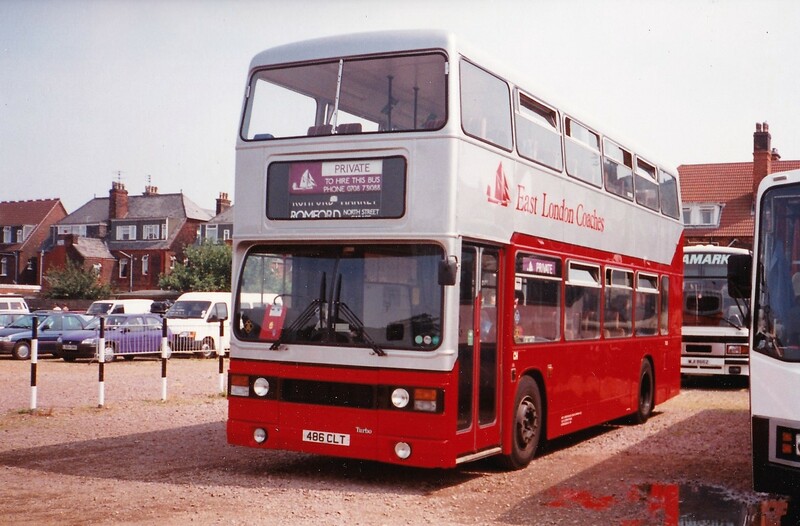 The 486CLT registration was gained in 1992 and the Titan was subsequently re-registered again as HVX771T, with the former plate assigned to Routemaster RMC1500. A comparatively large turn out at Great Yarmouth's Beach Coach Station today with some thirty coaches present. Nine of them were from the Richmond's Coaches fleet based in the 'Hertfordshire, Cambridgeshire and Essex corner'. The attendees were Van Hool Alicrons 230LYC, 753LNU, 275FUM and 892LTV plus Van Hool Astrons 438XYA and YER469 together with Van Hool bodied Volvo B10M's 424KPP, 851FYD and 729KTO. Unfortunately they were all on the back row so I couldn't get a good front picture but settled for a rear view of six instead! 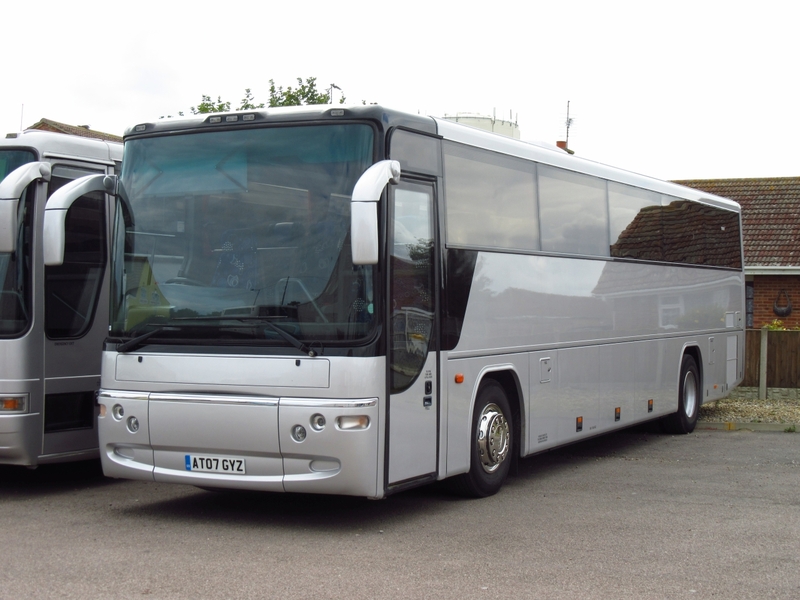 Other regular long stay visitors included Alfa Travels' Mercedes Benz Tourismos 88 (BX14OMO) and 92 (BX15OED) plus Gee-Vee Travel's VDL Bova Futura GT09GVT. Just a couple of proposed changes to local bus services from today's Notices & Proceedings Report published by the East of England Traffic Commissioner. 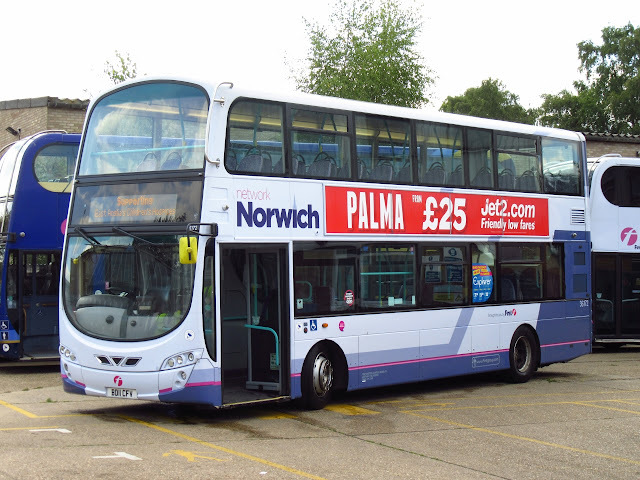 Paul Whincop of Peasenhall in Suffolk is amending the route, stopping places and timetable of his TM02 service between Halesworth Drive, Raydon and Thomas Mills High School, Framlingham from 5th September 2017. Go West Travel, trading as Stagecoach East, is cancelling three services including the 434 between Dersingham and Wells Next The Sea from 1st October 2017. 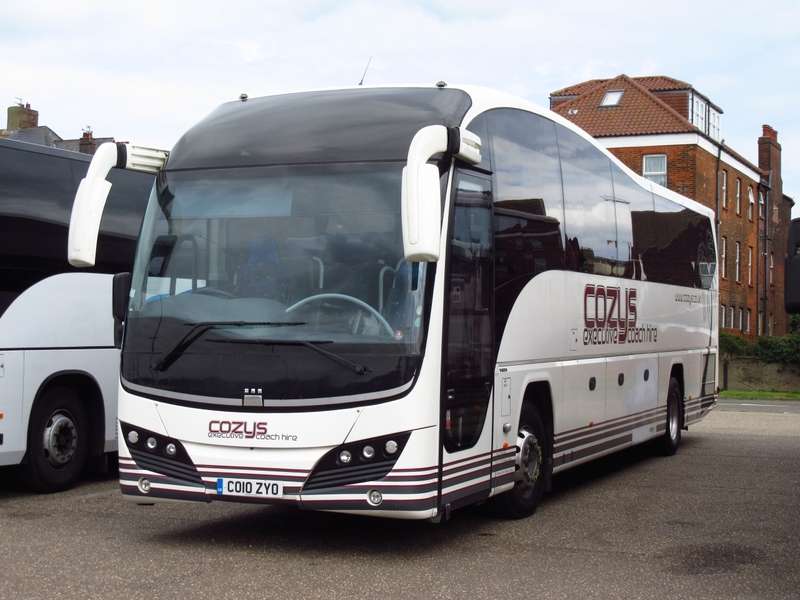 Four coaches are currently being made available for disposal on the Reynolds Coaches of Caister website. The oldest is Plaxton bodied Dennis Javelin 221WPH, which was new to Woodward of Glossop in 1989 as F740MVR. It is believed that it has already been snapped up for preservation. The others include Mercedes Benz Tourismo SN57LKC, first registered in September 2007, and Plaxton Premiere bodied Dennis Javelin AT55CZH from February 2006. The final member of the quartet is Caetano Enigma bodied Volvo B10M ICZ6697 which Reynolds acquired from Kent County Council in August 2012. It was new to Ulsterbus in May 2001. Returning to Castle Meadow, I had to quickly position myself for a photo of Simmonds decker MSU917. The Volvo B7TL / Plaxton President was formerly V188NLK and was new to Metroline in April 2001, passing to GHA in July 2014. Apologies for the photo quality. Before catching my Green Line StreetLite to Thorpe, I also observed Stagecoach East's Coasthopper SN61ORC heading into the city on the X29 from Fakenham - nowhere near the coast! 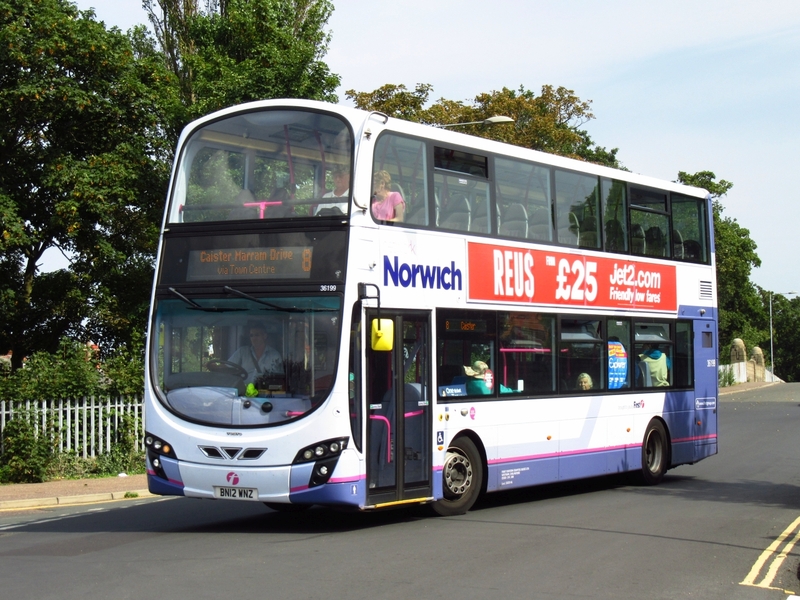 Meanwhile, First Great Yarmouth were using Norwich Blue Line 36179 (BD11CDY) on a round trip on the 2 to Barrack Estate following its MOT at Caister Road. 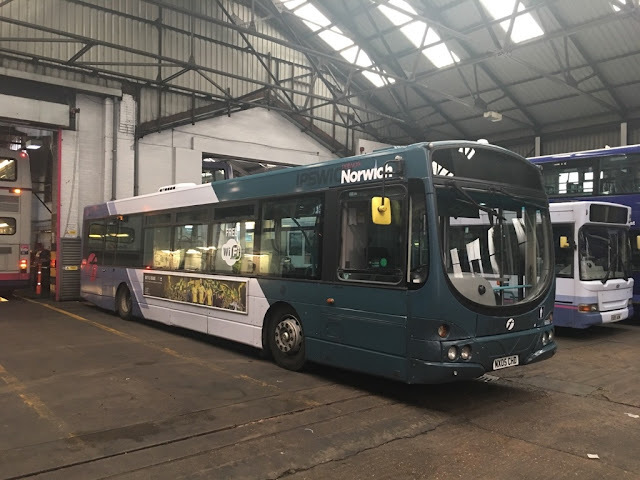 It later worked to Norwich and is pictured here by Kieran Smith at Norwich Bus Station on an X11 duty to Belton later in the afternoon. My thanks to Kieran for the photo. Today saw the First Norwich Bus Bash and Roundtree Way Open Day take place in the city. My Day began early to meet up with First Manager Chris Speed as we headed off to Wymondham to collect an old friend to take along to the event. The new owner of WEX685M asked Chris if he wanted to take it along for the day to add to the list of heritage vehicles attending the event. We arrived nice and early at Roundtree Way to assist in the moving of around Twenty buses up to Vulcan Road Depot to allow the movement of vehicles back at Roundtree. 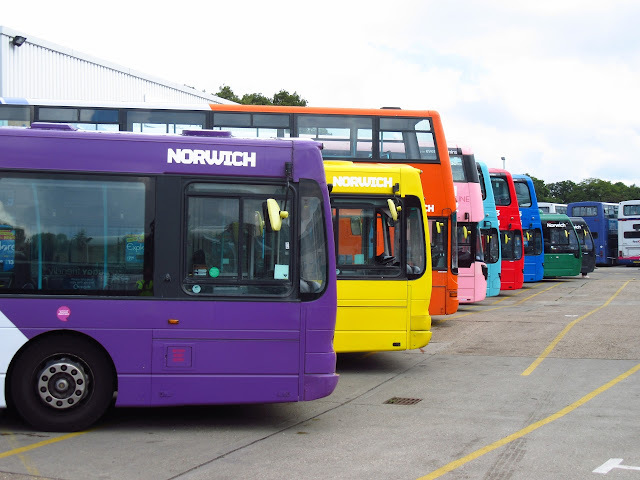 Next was organising the 'Rainbow' line up of Norwich Network vehicles, the decision was made to park them across the front of the workshops to allow the public to view and have photos taken in the buses also. Various posts on social media after the event have mentioned ways that the line up could have been done better in people's personal opinion but what they failed to take into account is that the Depot was still a working area despite the event so arranging the vehicles was not as simple as you may think, credit to the staff of First for making it happen and should not go without notice. Today aslo saw the first outing for newly painted Heritage liveried Volvo B7L 60916 YG02DKU, it now carries fleet number VW916 and looked very impressive in the morning sunshine! 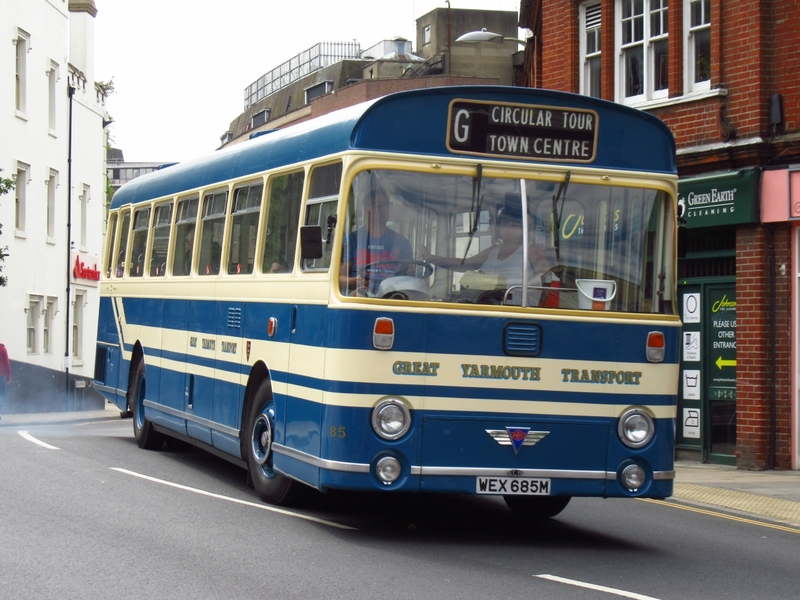 A full timetable of Buses were in operation running between the Depot and the City Centre, such was the demand that extra vehicles such as VW916 and Lowestoft & Ipswich Heritage ALX400's 30888 &32479 were drafted in for duties. Vehicles carried large amounts of passengers all day long and were enjoyed not just by enthusiasts but families and children too. The Depot also operated trips through the Bus Wash using Volvo B9TL 36172 which is now officially the CLEANEST bus in Norwich!. Heritage Vehicles in use included examples from the Eastern Transport Collection alongside privately owned vehicles including a late entrant in Viv Carters former ECOC Bristol VR VEX294X which looked pristine in the Afternoon Sun pictured below negotiating the yard at Roundtree Way. All in all a very sucessful day which was run in aid of the East Anglain Childrens Hospice, all vehicles used carried collection buckets for donations and there were stalls at Castle Meadow and Roundtree Way where people could find out about the Hospice and Donate to such a worthy cause. Credit to Chris Speed and all the staff involved today for an excellent event and to get more than just Bus Enthusiasts seeing how a modern depot operates, many families attended and went away having a very enjoyable day indeed. Always nice to catch up with many friends and aquaintances once again, thanks to Chris for allowing me along to help out. Here's to the next one, Grahame. 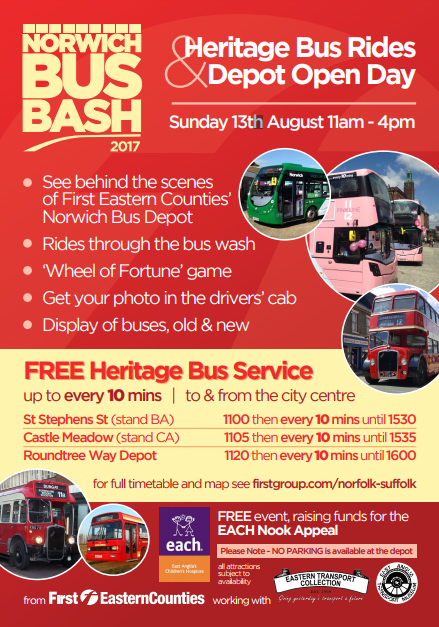 Tomorrow sees the Norwich Bus Bash Day organised by First Eastern Counties. 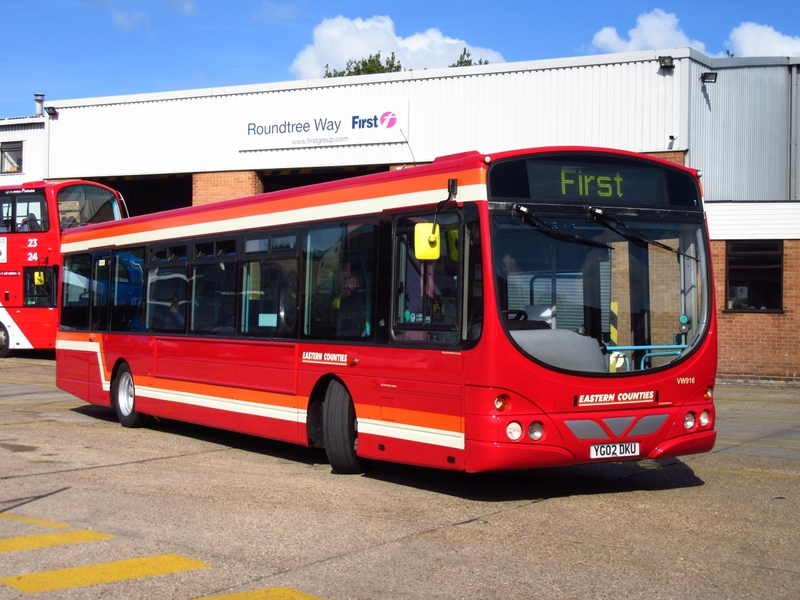 The day will see First opening their Roundtree Way Depot to the public for behind the scenes access to a working depot as well as a full day of Heritage Bus Services around the city. I shall be attending the day and bringing an old friend of the blog along in the shape of Great Yarmouth AEC Swift WEX685M. I'm joining up with one of its former owners and First Manager Chris Speed tomorrow so looking forward to a good day meeting up with fellow bloggers and enthusiasts for a day of Eastern Counties Nostalgia. 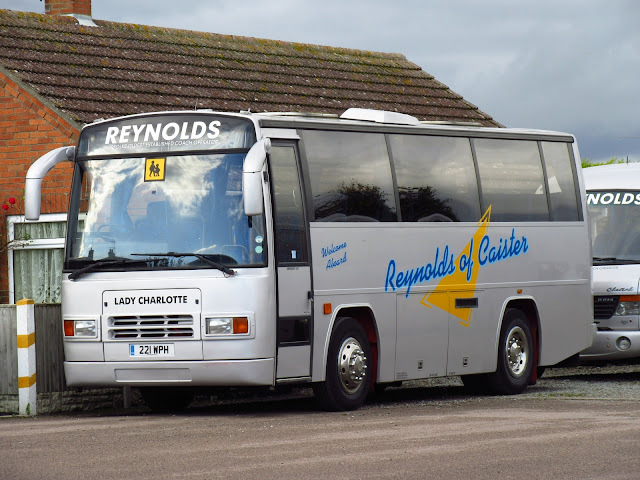 Reynolds Coaches at Caister On Sea have three new arrivals to report, I had noted a couple this week but registrations and details needed confirmation. Regular contributor Will Drake paid a visit to the garage on Ormesby Road to confirm all the details for us. Another pair of Plaxton bodied vehicles are the first to report, AT07GYO & AT07GYZ, are both in the full Silver livery awaiting Reynolds lettering and their names. The third arrival is former Norse Caetano bodied Dennis Javelin FJ03VMG which has been named Lady Merroney which is a name that has been used for a lot of Reynolds vehicles before over the years. A disposal to report is short wheelbase Dennis Javelin 221WPH; we are informed it has been acquired for preservation. Finally a view of the undercover parking area at the garage which was home to FJ03VMG, GR16REY, AW02ASU, BY10ZKA and BIG9853. Thanks to Will for the information and some of the photographs also. Grahame. Saturdays were always remembered for being changeover day for holidaymakers in the summer months and Beach Coach Station was a hub for travellers making their way to and from Great Yarmouth. In recent years the numbers have dwindled meaning less coach visitors to the town, today however saw a total of 31 visitors noted around lunchtime. First up is Former Stagecoach Western Volvo B12B (53032) SF07ANV which is now with Long Mile Coaches of Milton Keynes, it was new for Scottish Citylink services before being transferred to Stagecoach Bluebird before it was sold on. 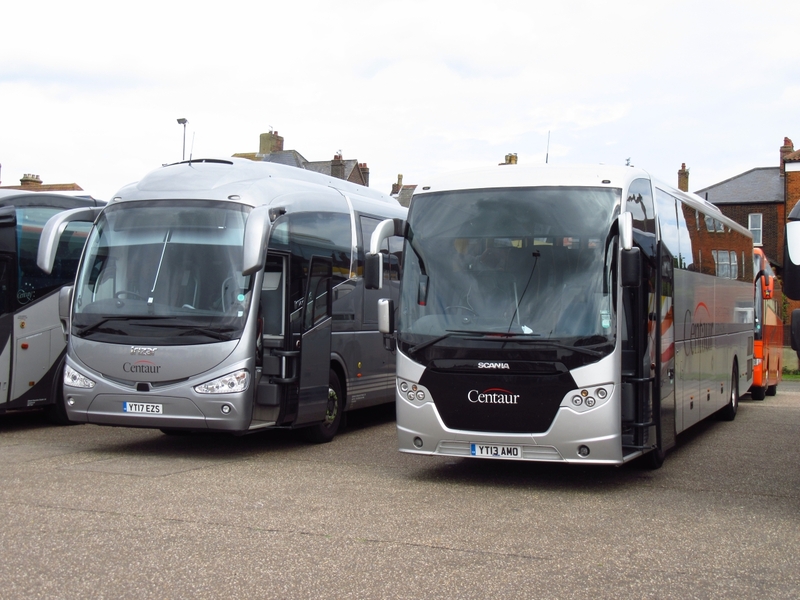 Centaur Coaches of Kent had three visitors today in the shape of Scania Irizar YT17EZS, another Scania YT13AMO and finally Caetano Levante FN62CHL. One of my favourite modern coaches is the Plaxton Elite, Cozys Executive Travel were in town with CO10ZYO a fine looking machine! Finally something a little different, CTT of Wolverhampton have this Mercedes powered Optare Solero FY03WZT seen here parked next to regular visitors to the town Gee Vee Travel of Barnsley. As previously mentioned, I undertook one of Leger Holidays' Battlefields of Europe tour over the past few days being primarily based in Belgium close to the French border. On the whole the Leger Holidays experience was very good with our guide Colin Parslow very knowledgeable on his subject matter which was punctuated with some interesting anecdotes and facts. Equally impressive was the speed and efficiency of the Leger staff transferring baggage from the feeder coaches to the tour coaches. Not so impressive though was the quality of comfort on the feeder minibus run back from Thurrock Services to Gorleston - even though arrival was early. As many of you will have seen from my twitter feed, I have been out of the country for five days taking in the Battlefields of Europe. Unfortunately this has meant a delay in the publishing of proposed changes to local bus services as contained in Wednesday's Notices & Proceedings Report published by the East of England Traffic Commissioner. 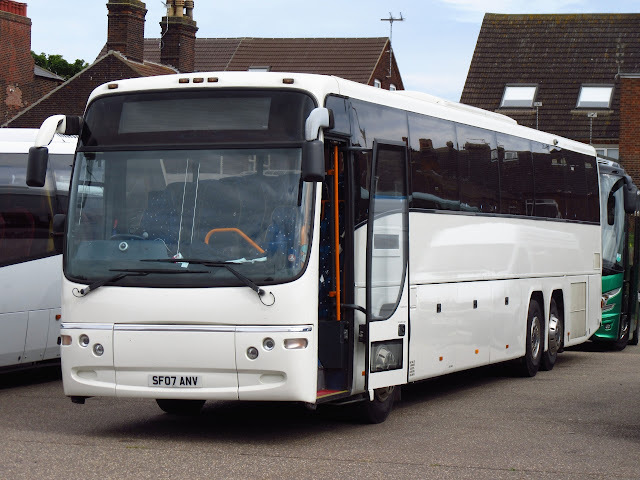 Sanders Coaches has registered new service 88 between North Walsham and Aylsham High School, via Swanton Abbot, commencing 3rd September 2017 and operating on school days only. 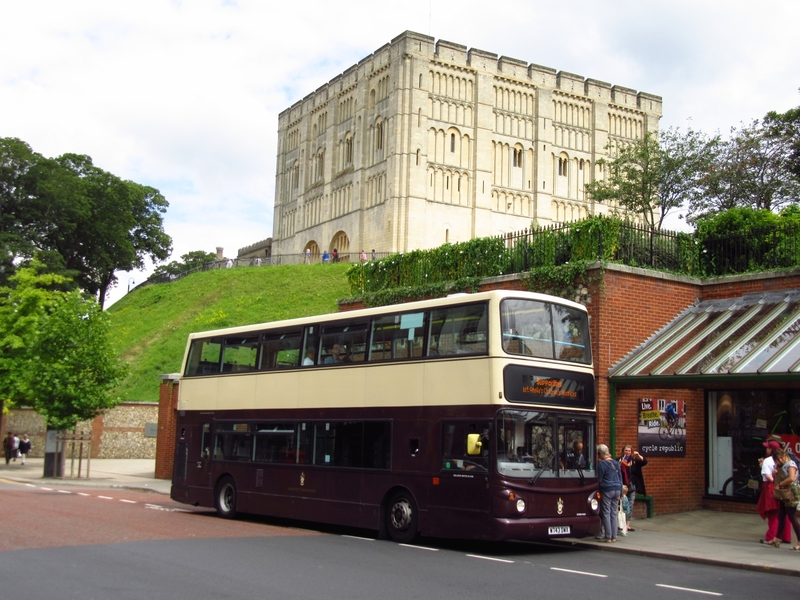 Ambassador Travel has registered a new service 51 under short notice, running from North Walsham to Wroxham from 4th September 2017 which will operate on college days only. St Nicholas House Prep School of North Walsham has applied for a new operating centre for one vehicle at Yarmouth Road. Also from the same market town is a similar application for one vehicle at by PTS Group (Norfolk) Limited for a site at Tilia Business Park at Tunstead Road in Hoveton. Continuing the double deck theme, today we feature a East Lancs bodied Scania N113DRB from the Nottingham City Transport. Numbered 352 in the fleet, L352MRR was new in April 1994. Subsequently it was acquired by TM Travel who used it on schools and college routes and random services around the Sheffield/Chesterfield area. 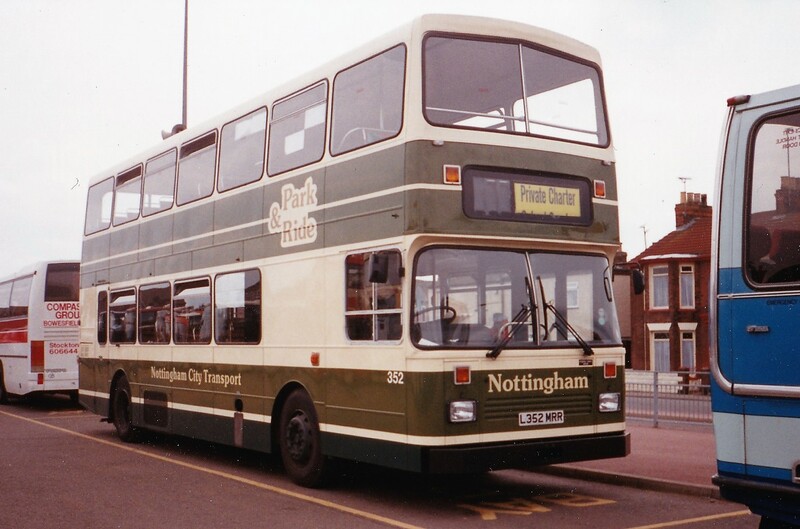 Following a repaint into Nottingham Corporation Tramway livery, it attended a number of bus rallies during 1997- including Showbus at Duxford and also at North Weld. 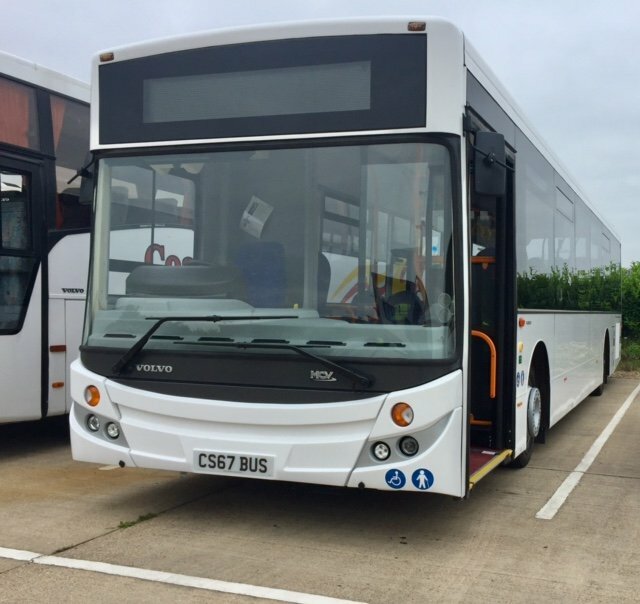 News this morning that Volvo B7RLE 66850 (MX05CHD) has returned to Caister Road for another loan spell here this week prior to its transformation into a Red Line vehicle for Norwich. It has been working in Norwich recently after a loan spell at Lowestoft also. Thanks to First for the info and Photograph. Almost exactly twenty-three years have passed at Great Yarmouth's Beach Coach Station since the photos were taken in the last post. Not as many coaches/buses visit now on a summer Saturday compared to those years. However, around two dozen examples were there today including Ipswich based Squirrells Coaches' Van Hool bodied Volvo B10M-62 SNZ7183. 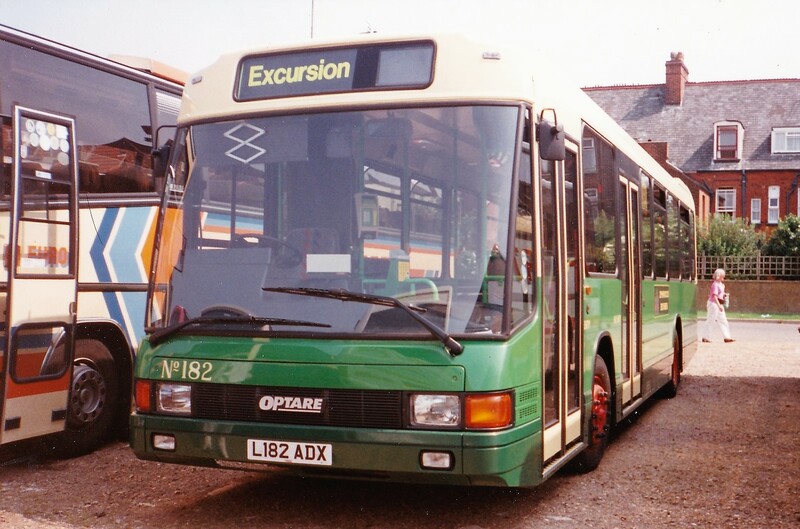 Originally registered as R17BUS when new to Whitelaw of Stonehouse, Scotland in April 1998, it was subsequently acquired by Soames (Forget-me-not) of Otley. Squirrells acquired the coach from Soames in March 2013. A member of the Bedfordshire based Three Star Coaches fleet can often be found at the coach station and today was no different with Volvo B12B FJ56YWB making an appearance. A smart looking visitor was South Mimms Travel's Jonckheere bodied Volvo B9R BX61DXE. 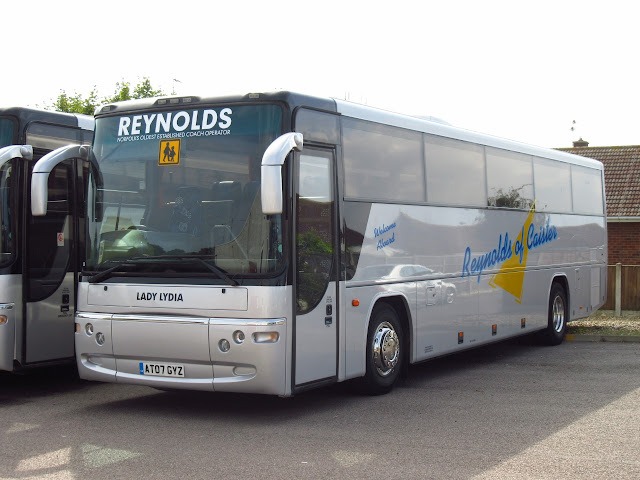 It was new to Reynolds Diplomat of Watford in September 2011. Even in 1994 Great Yarmouth's Beach Coach Station could be relied upon to provide that something unusual. Looking out some photos for today's Throw Back Thursday I came across some pictures of unusual visitors during August 1994. So today's offering is the first of a five part series of photos taken during that month. The first is more unusual in that it shows, not just one, but three double deck buses from the Northampton Transport fleet at that time! The trio were Alexander bodied Volvo B10M-50s with consecutive fleet numbers 85-87. Number 85 (F85XBD) was delivered in April 1989 with 86 and 87 (F86/7DVV) following in July. All made it into First Group Barbie colours with 87 also being re registered LSU717. F86DVV was notable in that it was exhibited at Showbus in Duxford during September 2001.